Your choice of flavors… strawberry, banana, peach, mango, raspberry or lime. A blend of pineapple, orange and cranberry juices with a touch of lemon. 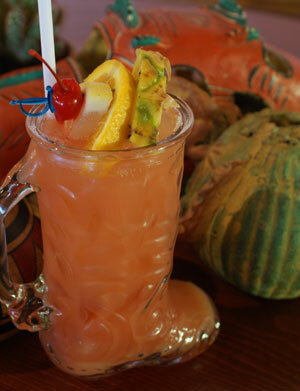 Served in Sam’s “kickin” cowboy boot. A creamy blend of bananas, cherry marinade and ice cream frappe; topped with whipped cream. A blend of chocolate and ice cream frappe; prepared with a swirl of chocolate and topped with whipped cream. A frozen fruit frappe of strawberries, banana, coconut, and pineapple. Topped with whipped cream. Strawberries and ice cream frappe freshly blended and topped with whipped cream. Named for that naughty blond sensation from the Bronx. A “fresh” blend of pineapple and coconut.